CARBON CERAMIC BRAKES - HEADS UP DISPLAY - ADAPTIVE LED HEADLIGHTS - REVERSE CAMERA - Finished In Black Sapphire Metallic Paint With Full Club Sport Bucket Seats. Only 1,196 Miles With Running In Service Completed At 1,053 Miles. 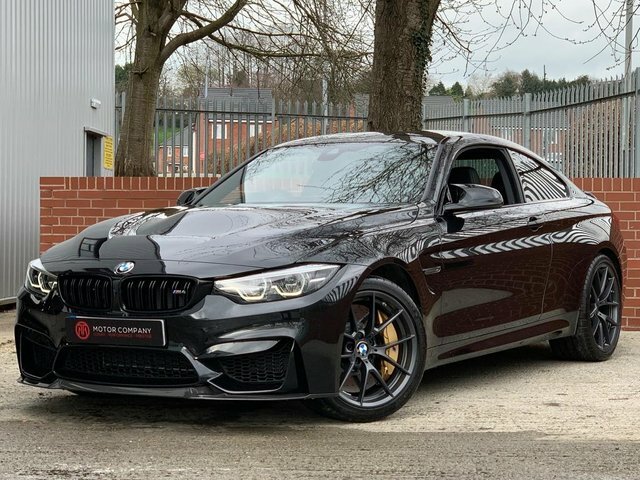 This Is A Very Special Example With Circa 10k Worth Of Options Which Include: M Carbon Ceramic Brakes, Adaptive LED Headlights, Head-up Display, BMW M Performance Alcantara Steering Wheel, Reversing Camera, Speed Limit Display and Privacy Glass. This Is The Highest Spec'd M4 CS Available In Showroom Condition Throughout. Please Call or Email To Discuss., Upgrades - Black Sapphire Metallic Paintwork, Headlight Wash, M Performance Alcantara Steering Wheel w/ 12OClock, 2 owners, Standard Features - 19in/20in M Light Alloy Wheel, Style 763M Orbit Grey, Alarm System (Thatcham 1), Auto Start-Stop, BMW Individual CS Specific Extended Upholstery, BMW Professional Radio with Single CD Player (with MP3 Playback Capability), Comfort Go Keyless Engine Start, Cruise Control with Brake Function, DAB Tuner, Electronic Windows - Front with Open/Close Fingertip Control, Anti-Trap Facility and Comfort Closing Function, Enhanced Bluetooth with Wireless Charging, Heat Protection Glazing with Green-Tint, Hill - Start Assistant, M Rear Spoiler, Metallic Paintwork, Navigation System - BMW Professional Multimedia, Park Distance Control (PDC) Front & Rear, Rain Sensor w/ Automatic Headlight Activation, Seat Adjustment - Front, Electric w/ Driver Memory, Seat Heating for Driver and Front Passenger, Tyre Puncture Warning System (TPWS). 4 seats, FREE NATIONWIDE DELIVERY - 5.4% APR FINANCE AVAILABLE - 12 MONTHS WARRANTY!!! Get the best deal on a used BMW M4 car for sale in Congleton by making your way to TMT Website Account today. You will find every available model listed here on the website, and as all our stock is competitively priced you should have no problem sourcing a pre-owned BMW to suit your budget. Take the opportunity to browse our current range online before contacting a member of the showroom team to find out more. Our friendly and knowledgeable staff will be more than happy to answer any questions and provide advice and guidance when necessary. Alternatively, why not pay a visit to our showroom in person and take a closer look at the selection of used BMW M4 car models for sale.